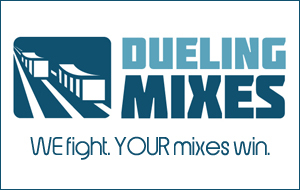 I got an email recently from a Dueling Mixes member. On last month’s webinar, Graham and I talked about how it took us roughly two to three hours to mix that month’s song. He said that he can’t ever see himself taking less than 25 hours to mix a song. He was worried that perhaps he was a hopeless case and should give up altogether. The good news is this: it really doesn’t matter how long it takes you to mix a song, as long as you get the results you want. Dave Pensado famously said that sometimes it takes him a full day to mix one song. And he’s Dave friggin’ Pensado. If it takes you a long time to mix a song, I wouldn’t worry about it. One thing you do need however, is some sort of method. You need a plan of attack for your mix, otherwise you could spend dozens of hours spinning your wheels and never getting anywhere. Over the years, I’ve developed a bit of a system for mixing. It’s almost a way of holding myself accountable, forcing myself to actually finish a mix. It involves several stages, but the simplest way to describe it is this: First, I get a static mix. Then, I do the core mixing stuff, like EQ, compression, effects, etc. Once I get to a point where I’m reasonably happy with the sound of the mix, I sit down and listen, making a list of changes I want to make. From there, I only work from that list. Once that list is complete, I stop and listen again and make another list. I repeat this process as long as needed to finish the mix. That’s my process. Do you have one? If not, you could probably benefit from coming to my mixing workshop on July 12th, at my studio here in Nashville. You’ll see my process in action and get to hone one of your own.